Yesterday, I went around the historic province of Cavite. 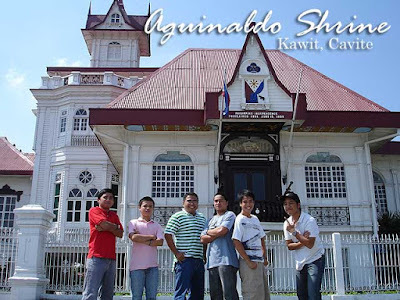 Our first stop was the Emilio Aguinaldo Shrine in Kawit. 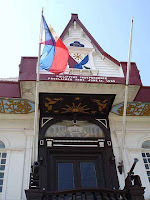 The ancestral home of Aguinaldo, the first president of the Philippines, it was the site of the proclamation of Philippine independence on June 12, 1898. On that day, the declaration of independence from Spain was read from a balcony of the house and the Philippine flag formally unfurled by Ambrosio Rianzares Bautista (and not Aguinaldo as is erroneously depicted in the old five peso bill). The Philippine National Anthem was also played for the first time by the Banda Malabon (of San Francisco de Malabon, now Gen. Trias, Cavite). Sadly, the museum was closed. I find this government practice of closing historical sites on Sundays stupid since it robs Philippine citizens the chance to visit these places when they’re off from work. I’ve been in the museum several times before so it wasn’t really a loss. But it would have been nice to see it again. If you want to find out what you could see inside, click here. 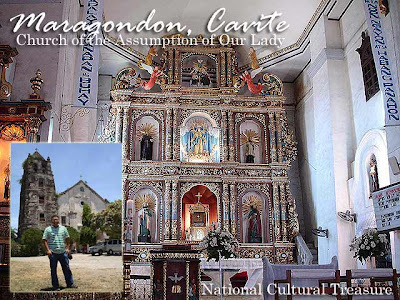 From there, it was a forty-minute drive south to Maragondon where we visited the Church of the Assumption of Our Lady which was declared a national cultural treasure, and the Bonifacio Trial House, a national historical landmark, which like the Aguinaldo Shrine, was closed on Sundays. 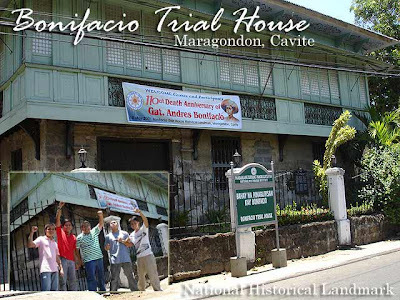 The house of Teodorico Reyes, now known as the Bonifacio Trial House, was where Andres Bonifacio and his brother Procopio were court-martialed. It was a kangaroo court as many historians put it. And their conviction for sedition and conspiracy and subsequent execution in the mountains of Maragondon haunts whatever legacy Aguinaldo was able to leave. 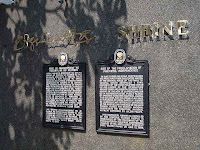 In the end, it was Bonifacio whom the nation recognized with a public holiday and grand monuments in Metro Manila. After this quick detour, we had to rush to Silang since we were in Cavite to help our brods campaign. It was actually fun going house to house giving out flyers of Congressman Boying Remulla whom we met earlier in the morning for coffee at his house. Another group was helping out Congressman Gilbert Remulla in Imus. 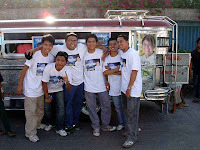 We also campaigned for Senators Joker Arroyo and Kiko Pangilinan. Silang is the largest municipality in Cavite in terms of land area. And the barangays we visited seemed to be on opposite ends. It was sad I wasn't able to check out their church since we had a lot of work to do. 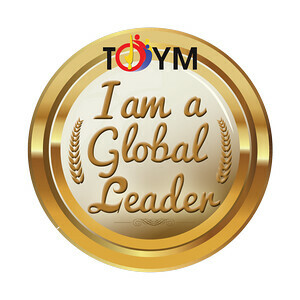 With our mission completed. 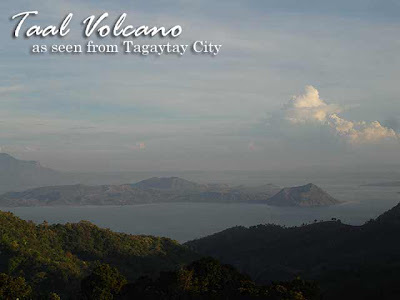 We passed by neighboring Tagaytay City to check out Taal Volcano before motoring to Indang to go night swimming at one of the natural spring resorts which are a plenty in the town. By the time we arrived in Indang, it was getting dark. So we skipped the church and headed to Barangay Tambo Kulit where most of the resorts could be found. We were pointed to the Rio Villa Nuevo Resort which many say is the best one in town. When we saw the small waterfalls in the compound, we said this was it! It was PHP12o per head for night swimming. There are several pools of spring water if you do not fancy walking on rocks and streams. 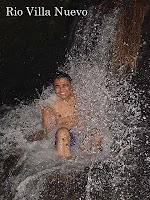 We went straight to the waterfalls and enjoyed the rush of cold water. After an hour, we rushed back to Tagaytay for a late dinner in Teriyaki Boy. We were supposed to go back to Manila. But the group enjoyed the trip so much that we decided to stay overnight. So we checked-in at the three-room inn under the Mile-Hi Diner which is located in the same restaurant compound. The standard room is PHP2,250. Good thing it was a Sunday and weekend vacationers had already left for Manila; so rooms were available. It was a cold night, a welcome respite from Manila's heat. Check out the photos in Multiply. I'm sure Bikoy Villanueva should have his account of our trip anytime soon. Today, the anniversary of the martyrdom of Chief Justice Jose Abad Santos of San Fernando, Pampanga (one of the three people in the 1000-peso bill), is a non-working holiday in the Province of Pampanga. Happy Jose Abad Santos Day to all! Very nice and informative site...i added it to my favorites. hi ivan..well travelled ka tlaga..
Hi mykiru! I have one entry on Naga City. Please check out the Destination Index on the right. Dear Ivan, i'm anastasia from HK. I will visit mariveles with my friends @august, may i know is mariveles and manila very near? how long time does it travel? cool site. felt like i was put back in the country. You take very good pictures. They could be marketed as postcards. A friend from the US requested Philippine postcards and all I could find were loose ones. I wanted sana a set of postcards (commonly available in major cities worldwide). You can market photos taken from your travels and sell them as a bound set of postcards or in book form. So, You're the winner of travel blog entry, CONGRATULATIONS ! Cool site, no wonder it won, keep up! Can I ask for directions going to Rio Villa Nuevo. Parang magandang i-explore. hi! parang magandang puntahan yang Rio villa Nuevo. pano ba pumunta dyan? Today is National Flag Day! Manila: The FEU campus is fantastic!